I had an unpleasant epiphany a few days ago. I had begun editing my NaNoWriMo novel from last year, now titled A Buried Stone Gate. I noticed a marked difference in writing style, pacing, and intensity in my manuscript right around the 50K word mark. The half written in November was plotted more slowly, with more tangents to edit; the latter half, written in spurts in December and finally finished in January of this year, is more judiciously written and far tighter, but missing a large chunk of the story. I knew my novel would be about twice the size of the NaNoWriMo word count requirement, and that I couldn’t finish it in a month, so I set a deadline for December 31. However, after finishing the first 50,000 words, I had severe burnout, and I could only write 500 words a day for most of December. My pace picked back up in January to around 1K/day. 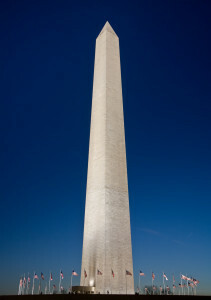 Most Americans are probably familiar with the Washington Monument. I learned in elementary school that the obelisk had a troubled construction history: it languished for several decades during the Civil War, and when building resumed they had to use stone from a different quarry. You can see the difference in the lower half of the monument. My novel Those Who Favor Fire had a similar history, written in 20-30K chunks over several years. I spent a great deal of time hiding the seams, matching the writing styles between each chunk, sometimes rewriting 4K-word chapters from scratch because the tone was too far off. Apart from a middle grade novel idea I’ve been developing, nothing I have planned will run under 50,000 words. Regardless, I’ll wind up with a better first draft if I write closer to my sustainable pace (which is around 1K words/day). Chris Breechen has a fair (if slightly obnoxious) article about the merits and pitfalls of NaNoWriMo, but I agree with his assertion that it “undermines the need for sustained effort.” NaNoWriMo is great if you want or need a 50K draft in 30 days, but if you write year-round, you spend as much time recovering from NaNoWriMo as you would have if you had written at your regular pace. I don’t think I’ll be participating in NaNoWriMo this year. Even if I finish my edits to A Buried Stone Gate by November (which would be tough), I don’t feel that writing 2K is doing my writing any favors. I know I can finish my drafts, having won NaNoWriMo three times (and finishing a fourth attempt some time later), so it makes more sense to set my own deadlines. I won’t say I’m “above” NaNoWriMo, but I may have outgrown it. I won’t look down on those who do participate; I do love being a cheerleader! I just need better drafts. I found that I had the same problem when I worked on one novel over chunks of different periods of time. Each time in between I’d become a different writer/person, so the old parts didn’t work anymore. I’ve always wondered what might happen if I did NANO, but I’m pretty sure I’d end up in the same boat as you.